1. In the bathroom. We are trying (and failing) to drink the suggested three liters of water per day. I tell you, it's impossible! It cannot be done! In working on (2), when not busy with (1), we decided to revisit the classic sci-fi adventure, and the primary god of our idolatry, the Star Wars universe. 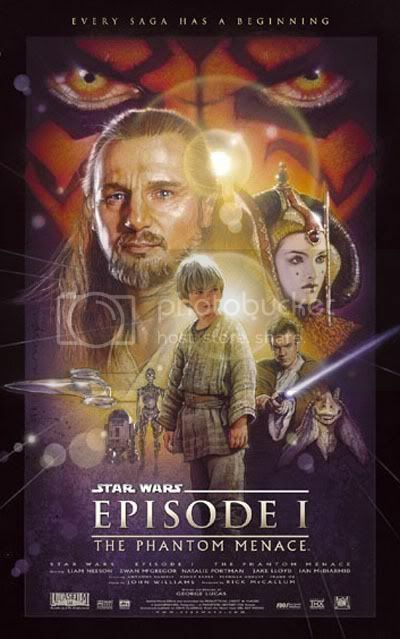 Being completist types, we decided to begin at the beginning: the widely-considered low point of the series, Star Wars: Episode I - The Phantom Menace. "Noooooo!" we hear the PPCC readership cry. Now, first of all, we think all the hate and ridicule Phantom Menace has accumulated since its 1999 release is somewhat unmerited. Yes, it's bad. 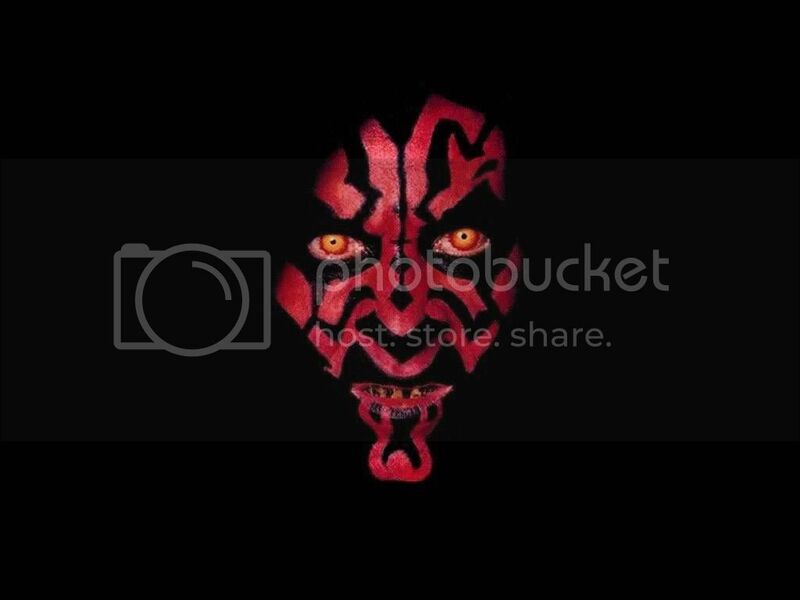 No, we don't know what a "phantom menace" means (a threat that doesn't actually exist?). But must it be so uncharitably vilified? In particular, we came to a surprising conclusion: Jar-Jar Binks is oddly funny once you give up on the film. Just give up. Let go. Then the humor will come. We-sa serious!! Okay, so we-sa lying a little bit too (oh, doo-doo). We actually lost interest about forty minutes into the film, skipped forward to watch the magnificent lightsaber duel during the finale (wherein we pepped up quite a bit... go, John Williams! 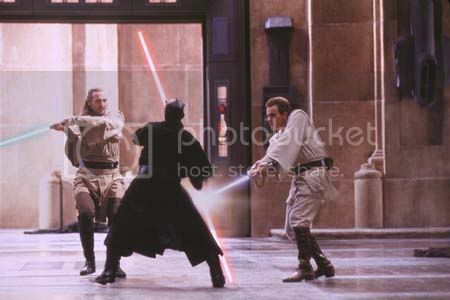 ), and then quickly skipped even more forward to the lightsaber duel in the finale of Episode II - Attack of the Clones. Verdict: Episode I's lightsaber duel is more deliciously, magnificently glorious. Obi-Wan: tragic Greek non-hero? Or tragic philosophical innovator? Essay coming soon to a PPCC near you! Phantom Menace begins during a time of confusing political unrest in the galaxy. The gorgeous planet Naboo, a land of waterfalls, Renaissance Italian architecture, fantasy-novel throwback fashions and the dreaded Jar-Jar, is under a trade embargo (or something) by evil "Trade Federation" aliens carrying unfortunate "Asian stereotype" accents. George loses early points for Jar-Jar and the accents. 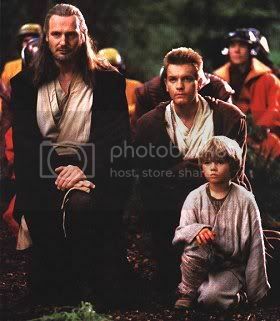 In come our dashing Jedi, Qui-Gon Jinn (Liam Neeson, he of the interesting bone structure), and his "Padawan" learner, a young and clean-shaven Obi-Wan Kenobi (Ewan McGregor, he of the hot). The Jedi, nominally peacekeepers, look more like militaristic interventionists who choose to side with Naboo's Queen Amidala (Natalie Portman sometimes, Keira Knightley other times) because of some vague notions about sensing the "Dark Side of the Force" in the Trade Federation. It all sounds a bit Crusader-ish to us, but then we've never understood Jedi morality (more on that later). The Jedi and their munchkin. 1. Obi-Wan Kenobi is Anakin Skywalker's reluctant master. Fail forseen. 2. Anakin Skywalker worships the beautiful Queen Amidala. Double trouble! 3. No one knows who the powerful, evil Darth Sidious could possibly be, even though his main disguise is a hooded robe. 1. Original trilogy (1977-1983): Why is the Empire considered so evil? 2. Prequel trilogy (1999-2005): Why are the Jedi considered so good? There seems to be a stark moral dichotomy at work here, without any evidence to back things up. We just don't buy it, George! Look: Both the Empire and the Jedi are powerful, violent and interventionist. Both of them use other planets in their galaxy-wide martial chess game. A lot of interesting talk has gone into how George Lucas added a strong touch of Zen to the Jedi - Yoda's teachings in Empire Strikes Back, for example. But what monastic order has its own characteristic weapon? Indeed, the Jedi seem to be much more samurai than Zen monks (Obi-Wan Kenobi was inspired by archetypal samurai actor Toshiro Mifune's character in The Hidden Fortress, and Mifune was apparently briefly considered for the role before it went to Alec Guinness). And the samurai were a class of politically-aligned warriors: not a moral order! So why all this moral indignation on the part of the Jedi? Are they a religion? They keep insinuating that an ultimate "good" is on their side... but their actions are just as morally ambiguous and politically motivated as any other group! Apart from dressing in black and growling, what does this man do which is so evil? What does he do which the Jedi don't do? We just don't get it, man. 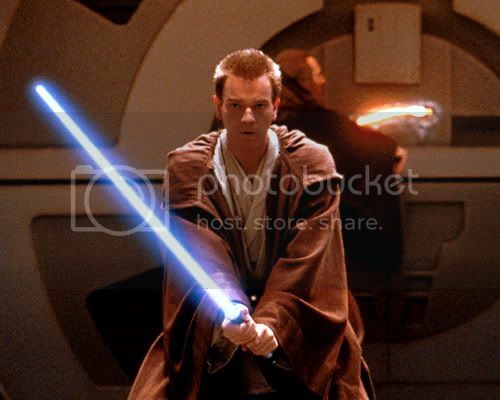 If there's one great thing that came out of Phantom Menace, apart from Ewan McGregor's spot-on interpretation of a soon-to-be-Alec-Guinness Obi-Wan Kenobi (McGregor seems to be the only one in the prequel trilogy who "gets" it, or are we distracted by his hotliness?) AND apart from the glorious sound effects during the Tatooine pod race (ka-chunk-chunk-chunk, whizzzz! ), it was John Williams' bombastic, energizing score - in particular, the glorious track Duel of the Fates. And guess what! They're singing in Sanskrit! Yes, really. A Sanskrit translation of an ancient Welsh poem! How about that, eh? We can also say that Duel of the Fates is great for pumping iron in the gym: as a friend of ours once said, it "makes you want to punch someone" (he was actually talking about Simba's return to Pride Rock in Lion King, but the feeling is similar - get pumped!). Even just a single picture, such as this one, gets the PPCC positively pumped. Daaaa-daaaaa! Daaaa-DAAAAAA! DA-DAAAAAAAA! A well-calibrated nickname, such as Francesco Schiavone's famous, ferocious Sandokan, can make or break the media fortune of a boss. He earned it for his resemblance to Kabir Bedi, the [Indian!] star of the Italian television series Sandokan, the Tiger of Malaysia, based on Emilio Salgari's novel. First we discover that Roshan Seth once starred in an Italian mini-series about Aldo Moro, and now this! Cultural cross-fertilization, indeed. Amey - OOH, thanks for that link! BHAI BHAI indeed! I think the Jedi are meant to be like Shaolin Monks. They have weapons (their own martial art fighting style), they are an order with a similar inner structure and even though they claim to stay away from wordly affairs, they are one of the main players in Jiang Hu (sometimes for and sometimes against the goverment). And the samurai were a class of politically-aligned warriors: not a moral order! umm....excuse me? have you ever even taken the time to *read* bushido? the seven moral guidelines of the bushi....more commonly known as samurai? not to mention reading hagakure the "bible" of the bushi. yes, they followed a daimyo....into war and to their death but didnt the european knights follow their king to the same ends for the same purpose? actually they followed the church who controlled the king. the samurai had no manipulative religious forces such as this. maybe you should do more research before you decide to start smearing the name, reputation and intentions of my brethren. especially without bringing in their close yet inferior europian counterparts. if you have anything to say to me....look me up under arizona coleman on facebook....the one with the lightsaber. i dont feel like making an account here. it really wouldnt have made any sense to the plot line if han was in ROS. he wasnt a major player until he accepted the job of ferrying luke, ben and the droids to alderaan. the only way they could have made him fit was to feature him as he was in his smuggler "duties" and how he got himself in such deep s--t with teh hutts. even then, i think, it would have detracted from the story line of that particular episode. it is an interesting thought though i will have to admit. i wish i could just delete it.